If you were a fan of last year's terrifying White House Christmas decorations, then you'll be relieved to know that Melania has fittingly continued on her horror-themed decorating streak in 2018. 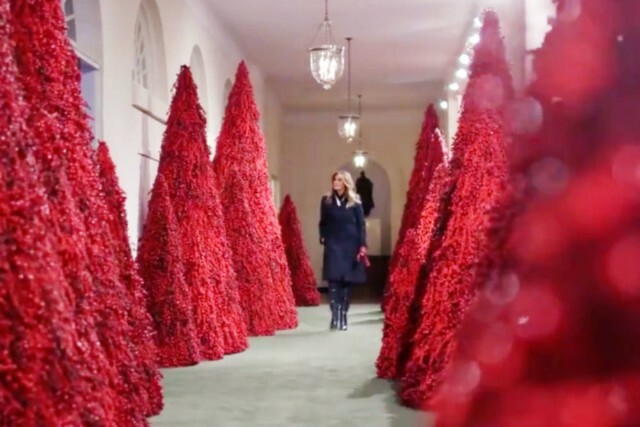 Melania Trump unveiled this year's holiday decorations at 1600 Pennsylvania Avenue and social media had a meme breakdown over a forest of crimson trees in the East Wing hallway. The Christmas Tree lighting will be in the evening on Wednesday, November 28. In the East Garden Room, the First Family Christmas card and ornament are on display, while an array of other national symbols are in display in other rooms of the white house. The tree measures 18 feet tall and is dressed in over 500 feet of blue velvet ribbon embroidered in gold with each State and territory. Visitors are encouraged to write messages to their loved ones who are on duty or overseas with provided digital tablets. The China Room highlights White House State dinners from administrations under various presidents, including Theodore Roosevelt, John F. Kennedy, and Donald J. Trump. Melania Trump's office explained that "72 handmade paper ornaments representing six regions across America hang from four 14-foot Noble fir trees". These include a massive gingerbread replica of the National Mall on display in the State Dining Room. They are decorated with 14,000 red ornaments that are meant to symbolize valor and bravery. It's constructed out of 25 pounds of dough, 25 pounds of chocolate, and 20 pounds of icing. The East Room focuses on "diversity and ingenuity of American architecture and design with four custom mantelpieces showcasing the skylines of New York City, St. Louis, Chicago, and San Francisco". This year's Christmas theme is called "American Treasures" and honors the "unique heritage of America" according to the White House. The White House plans to once again suspend CNN's Jim Acosta's press pass after a court-mandated temporary restoration expires. Trump responded that he believed it was an invasion, telling Acosta , "Honestly, I think you should let me run the country".